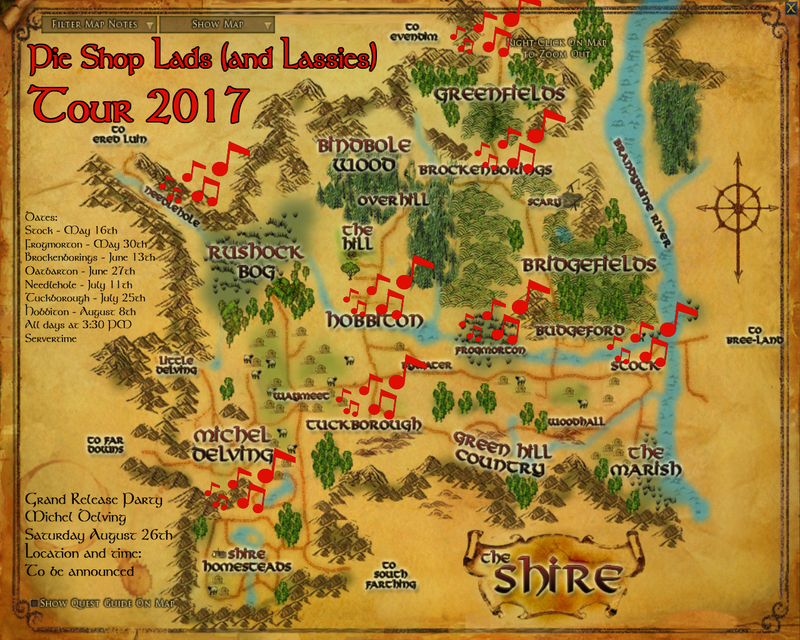 On Tuesday May 16th, the Pie Shop Lads (and Lassies) will be launching their 2017 debut 7-concert Tour of The Shire, with a concert in Stock at the Golden Perch. It starts at 8:30 PM ((UK time)) Every fortnight, they will give a new concert in a different town in the Shire, leading up to a grand release party in Michel Delving, where Pie Shop Lads (and Lassies) will present brand new lyrics for the best of the songs from the tour! Free admission for the Free Folk - that is why they are the Free Folk. Non-Hobbits are advised to wear their dancing shoes, and everyone should bring their best mood and broadest smile. Grand Release Party in Michel Delving with release of brand new lyrics and guest bands performances, ale, pie, ale, music, pipe-weed, ale, beer, ale, and good times! The whole minstrel trade will be there, so it is your chance to hang with your favourite bard! Saturday August 26th - location and time to be announced. The Pie Shop Lads (and Lassies) are looking forward to sharing their music with you all, and to help them Shire Hobbits get their feet dancin'! Well met, and we hope to see you there!